VIPA is the acronym for “Virtually Imaged Phase Array”. A VIPA is a special case of Fabry-Perot etalon with three distinct coatings. This results in quite different performance compared to a regular etalon. One surface of a VIPA has an anti-reflection coated section adjacent to a high reflector. The opposite surface is coated with a partially transmitting mirror. Typically, the partial reflector has a reflectance >90%. Light is introduced into the VIPA at a line focus on the AR coated area. The two surfaces are parallel, and the VIPA is tilted so that the portion reflected from the partial reflector is fully incident on the high reflectance zone of the input surface. So, a single input beam is converted to a series of parallel output beams of gradually decreasing intensity. These beams will constructively interfere at an angle that depends on the wavelength. Placing a lens between the VIPA and an array detector (CCD or similar) allows recording of a spectrum of the input light. Each subsequent beam has a precise increase in phase and fixed lateral displacement, hence “phase array”. There are several parameters that define the performance of a VIPA. The first is its optical thickness. For a solid etalon this is OPD=2ntcos(θ), where n is the refractive index, t is the thickness, and θ is the angle from normal within the VIPA. From the optical thickness, the free spectral range (FSR) is approximately c/OPD. Analogous to a regular etalon, the angular dispersion of the VIPA output will repeat every time the input frequency (or wavelength) increases by 1 FSR. The second important parameter is the reflectance of the output mirror. In principle, a higher reflectance mirror will increase the resolving power of the VIPA. Our experience is that a reflectivity of about 95% will result in a finesse of about 50. In other words, it will be possible to distinguish wavelengths separated by 1/50th of the FSR. The third important parameter is the internal angle of the light travelling through the VIPA. Smaller angles increase the angular dispersion, but there are a couple of factors that put a lower limit on this angle. The first reflection from the partial reflector must be fully incident on the high reflector so a narrower transition between the antireflection coating and the high reflector enables a smaller angle. This transition is typically less than 100 μm. Secondly, the lateral offset of the reflected beam must be greater than the width of the input beam plus the width of the coating transition. Normally, this condition is optimized when the beam waist is located where the input beam first reflects from the partial reflector. The VIPA coatings must be selected to match the wavelength range of interest, and the substrate material must also be transparent. 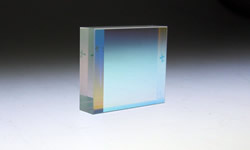 The LightMachinery catalog VIPAs are all made of fused silica. Customized designs using calcium fluoride or silicon allow operation further into the infra-red.